An e-book containing the papers and presentations from the European Central Bank's central banking forum conference in Sintra, Portugal, is now available. ECB President Mario Draghi and his colleagues are to be greatly commended for running a forum that is so open to profound challenges to central banking orthodoxy. The volume contains a paper by Olivier Blanchard, Eugenio Cerutti and me on hysteresis — and separately some of my reflections asserting the need for a new Keynesian economics that is more Keynesian and less new. Here, I summarize these two papers. Blanchard, Cerutti and I look at a sample of over 100 recessions from industrial countries over the last 50 years and examine their impact on long-run output levels in an effort to understand what Blanchard and I had earlier called hysteresis effects. We find that in the vast majority of cases, output never returns to previous trends. Indeed, there appear to be more cases where recessions reduce the subsequent growth of output than where output returns to trend. In other words “super hysteresis,” to use Larry Ball’s term, is more frequent than “no hysteresis." This finding does not in-and-of-itself establish the importance of hysteresis effects. It might be that when underlying growth rates fall, recessions follow, but that recessions have no causal impact going forward. In order to address this issue, we look at the impact of recessions with different precursors. We find that even recessions that are associated with disinflationary monetary policies or the drying up of credit have substantial long-run output effects suggesting the presence of hysteresis effects. In subsequent work, Antonio Fatas and I have looked at the impact of fiscal policy surprises on long-run output and long-run output forecasts, using a methodology pioneered by Blanchard and Daniel Leigh. Since fiscal policy effects operate primarily through aggregate demand, this provides a way to avoid the causation question. We find that fiscal policy changes have large continuing effects on levels of output suggesting the importance of hysteresis. I was struck that in a vote taken at the conference, close to 90 percent of the participants indicated that they believe there are significant hysteresis effects. While there is much more work to be done, I believe that, as of right now, the right presumption is in favor of hysteresis effects, despite their exclusion from the standard models used in almost all central banks. My separate comments in the volume develop an idea I have pushed with little success for a long time. Standard new Keynesian macroeconomics essentially abstracts away from most of what is important in macroeconomics. To an even greater extent, this is true of the dynamic stochastic general equilibrium (DSGE) models that are the workhorse of central bank staffs and much practically oriented academic work. Why? New Keynesian models imply that stabilization policies cannot affect the average level of output over time and that the only effect policy can have is on the amplitude of economic fluctuations, not on the level of output. This assumption is problematic at a number of levels. First, if stabilization policies cannot affect average levels of employment and output over time, they are not nearly as important as if they can. Beginning the study of stabilization with this assumption takes away much of the motivation for doing macroeconomics. The problem has always been that it is difficult to beat something with nothing. This may be changing as topics like hysteresis, secular stagnation, and multiple equilibrium are getting more and more attention. As well they should. U.S. output is now about 10 percent below a trend estimated through 2007. If one attributes even half of this figure to the effects of recession and assumes no catch up on this component until 2030, the cost of the financial crisis in the U.S. is about one year’s gross domestic product. And matters are worse in the rest of the industrial world. As macroeconomics was transformed in response to the Depression of the 1930s and the inflation of the 1970s, another 40 years later it should again be transformed in response to stagnation in the industrial world. Maybe we can call it the Keynesian New Economics. This is an outstanding and thought-provoking comment by one of the world's best economists. In this short comment, Larry Summers eviscerates standard new Keynesian macroeconomics as well as the dynamic stochastic general equilibrium (DSGE) models that central banks and academics around the world rely on to form their policies (also see Brian Romanchuk's latest on output gaps and MMT). For those of you who never took an economics course in your life, I'll explain the basics. Hysteresis is the time-based dependence of a system's output on present and past inputs. The dependence arises because the history affects the value of an internal state. To predict its future outputs, either its internal state or its history must be known. An easy way to think of hysteresis is how it impacts the labor market. Hysteresis argues the longer someone remains unemployed, the harder it will be for that person to find a job and the greater the risk that he or she will not find a job, stop searching for work and end up on welfare or claiming disability benefits. This is why economists closely follow "long-term structural unemployment" and how it impacts the labor force participation rate which reached its lowest point in 38 years in October, with 62.4 percent of the U.S. population either holding a job or actively seeking one. The unemployment rate is falling, but that traditional sign of health for the American worker can be misleading. A larger share of the U.S. population is now out of the labor force than at any time since 1977 -- an era when manufacturing was king and most women didn’t have jobs. As the drop in workforce participation continues to vex economists and policymakers alike, Goldman Sachs economists are projecting the trend will roll on. Researchers for the investment firm say they expect the current labor force participation rate of 62.4 percent to fall by about a quarter of a percentage point annually in the coming years, reaching 61.8 percent by 2018. Declining labor force participation, in turn, will help drive down the unemployment rate, according to the research note. Goldman economists expect that number to reach 4.5 percent by 2018, down from its current 5.1 percent. Six years ago, unemployment hit its recessionary peak of 10 percent. The cause of the decline in labor force participation is a source of much debate. Many economists agree it’s in large part a structural phenomenon, driven by the mass retirement of baby boomers. Others point to its cyclical roots in the Great Recession. Goldman economists also drew attention to the ongoing decline among so-called prime-age workers, noting “the underlying cause is unclear.” Some have pointed to the dearth of decent paying jobs and lack of paid parental leave as contributing factors. The United States unemployment rate now stands just above five percent, though the real jobless figure is in the teens. The Federal Reserve-induced economic expansion continues, and everyone is rejoicing. But is the labor market really in such a rosy state? A new report from the Goldman Sachs Group suggests that the unemployment rate will dip below 4.5 percent by the end of 2018 as a growing number of people will drop out of the workforce. 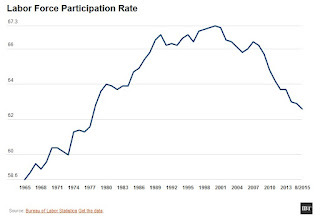 Today, the labor force participation rate, or the share of the working population, is at a 37-year low (SEE: U.S. labor force participation rate falls to 1977 levels at 62.6%). The share of the U.S. population in the workforce – individuals over 16 who have a job or who are looking for a job – declined to 62.4 percent last month. There has been a strong debate over the past couple of years as whether the trend of a falling workforce participation is part of a potential long-term shift in the overall economy or the business cycle. Whatever the case, the Goldman Sachs analysts say the trend won’t reverse because an exponential number of Baby Boomers are retiring. This is important data for the Federal Reserve when it debates whether or not to raise interest rates. Some say the only areas of the economy that are growing are ones that rely on government transfer payments or Fed stimulus. In a recent comment of mine discussing which bond bubble worries the Fed, I stated even though I agree with those who say the possibility of rate hike this year shouldn't be ignored, I wouldn't bet on it and would only worry about it next year once we see clear signs that a global recovery is well underway. In that comment, I explained why the Fed has a serious deflation problem to contend with, especially after China's Big Bang, and it knows it would be making a monumental mistake if it raises rates anytime soon. Moreover, I don't see an end to the deflation supercycle and think the era of low growth, low inflation/ or deflation and low returns is here to stay for a very long time. Now, you might have noticed last week China abandoned its one child policy, allowing all couples to have two children for the first time since draconian family planning rules were introduced more than three decades ago. While we can debate the merits of such a change in policy, why do you think China all of a sudden changed it? The answer is that China is grappling with its deflation demons and desperately needs to spur growth. It's doing everything possible to stimulate its economy, including using its pension fund to inflate its stock market, but so far, nothing seems to be working. This is why one hedge fund trader told me to pay attention to the mighty greenback, which I already do, for clues as to whether or not the Fed is really ready to move on rates. If the USD continues to appreciate relative to other currencies as China's economy slides into debt deflation, things will get very messy for the Fed very quickly because import prices will keep declining, sending inflation expectations lower and raising more angst from an already concerned Fed. "I see this as more of a warning, a red flag that there's something going on here that isn't in the models, that we maybe don't understand as well as we think, and we should dig down deep deeper and try to figure this out better," he said during a panel discussion at the Brookings Institute in Washington. Williams, who is a voting member of the Fed's policy-setting panel through the end of the year, has said the central bank should begin to raise interest rates soon but thereafter go at a gradual pace. He added that the low neutral interest rate had "pretty significant" implications for monetary policy, and put more focus on fiscal policy as a response. "If we could come up with better fiscal policy, find a way to have the economy grow faster or have a stronger natural rate of interest, then that takes the pressure off of us to try to come up with other ways to do it, like through a large balance sheet or having a higher inflation target," Williams said. "It also means we don't have to turn to quantitative easing and other policies as much." On Wednesday, the Fed held interest rates near zero but signaled that a December rate rise remains firmly in play. We'll see if the Fed pulls the trigger in December (I'm highly skeptical) but one thing is clear, the Fed and other central banks cannot address deep structural problems plaguing advanced economies and fiscal policies have to change dramatically in order to fix these structural issues. Moreover, as I argued here, central banks' ZIRP and QE policies are fueling inequality, effectively exacerbating global deflation, and that just adds to the deep structural issues plaguing the global economy (never mind America's pension justice which is another deflationary catastrophe). The problem is with public debt levels so high, will there be enough political will to spur growth through more government spending? I will leave that up to U.S. politicians and voters to figure out, but Larry Summers is right, we need a new macroeconomic paradigm to deal with the structural deficiencies plaguing advanced economies. Below, Neera Tanden, Center for American Progress, and former Treasury Secretary Larry Summers take a look at why business investment is caught in a vicious cycle. They also discuss whether low rates are enough and discuss ways companies can increase demand and raise long-term value. Great discussion, take the time to listen to it.